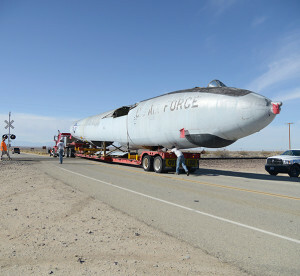 The fuselage of the XB-47A Stratojet heads south on Rocket Site Road toward Rogers Dry Lake and its temporary home at North Base. The aircraft arrived disassembled aboard several flatbed trucks Sept. 19, 2016. 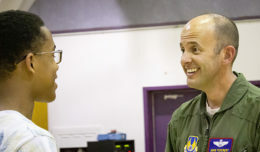 It is expected to be reassembled, refurbished, and displayed at the Air Force Flight Test Museum within the next year. An historic aircraft with close ties to Edwards Air Force Base, Calif., returned to its roots after more than six decades the morning of Sept. 19, 2016. 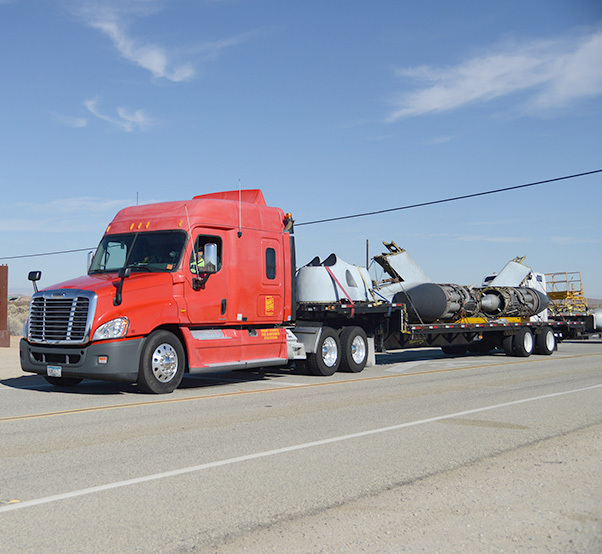 The XB-47A Stratojet bomber, an icon of aerospace history, returned to Edwards at approximately 9 a.m., arriving disassembled on several flatbed trucks. The aircraft entered the base on Rocket Site road, then proceeded across Rogers Dry Lake to its temporary home on North Base for reassembly and restoration by Air Force Flight Test Museum volunteers. George Welsh, AFFT Museum director, said the restoration will be done in stages. “The assembly and external restoration of the aircraft should take about one year,” he said. The XB-47A was the precursor to the U.S. Air Force’s strategic bomber aircraft family, to include the B-52 Stratofortress, B-1 Lancer and B-2 Spirit. Its multi-engine and swept wing profile were major innovations in post-World War II combat jet design, and contributed to the development of modern commercial jet airliners. A flatbed truck hauling engines and other aircraft components of the XB-47A Stratojet enters the northern boundary of Edwards Air Force Base Sept. 19, 2016. The historic aircraft returned to Edwards Air Force Base after more than six decades on display at Chanute Air Force Base, Illinois. It will eventually be reassembled and displayed at the Air Force Flight Test Museum. This XB-47 is the earliest survivor of the B-47 series and served as one of two experimental test airframes. The Air Force accepted the airframe December 1948 and logged almost 100 hours of test flights with the contractor, Boeing, and more than 237 for the Air Force. Testing included flight time at Edwards. There were only two XB-47 prototype aircraft ever built, and both were test flown at Edwards. However the number one XB-47, 46-065, was disassembled and eventually scrapped by the Air Force in 1954, making the number two prototype, 46-066, the sole surviving XB-47. After completing flight testing at Edwards from 1948 to 1954, tail number 46-066 spent the next six decades on static display at Chanute Air Force Base, Ill.